OXFORD, Miss. 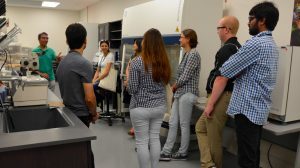 – The University of Mississippi School of Pharmacy and its National Center for Natural Products Research conducted their first course recently in the Natural Products Training Lab, covering various aspects and techniques of botanical authentication. Over the three-day course, participants from industry and academia at and outside the university learned basic techniques for analyzing natural products using instruments that perform chromatography, microscopy and taxonomy. The course also offered solutions to problems related to authentication and quality issues in real workplaces, while providing practical tools that participants can apply to their own analytical processes. The training center includes five laboratories and occupies 3,000 square feet that can be used to teach best practices in natural products and botanical dietary supplements. It is a collaboration between Ole Miss researchers and Waters Corp., with Waters provided several cutting-edge analytical systems and software. These include three liquid chromatography/mass spectrometer systems, as well as an accelerated supercritical fluid extraction system, each designed for various applications. The next course is scheduled for Feb. 12-16, 2018, and registration is available at http://pharmacy.olemiss.edu/nptl/. Both three- and five-day courses will be offered.